Operating a farmers’ market is hard work. As a market manager, you wear many hats – from organizing and liaising with farmers and vendors, to directing promotional outreach to customers, to building partnerships with city and regional agencies, to ensuring the integrity of your market in accordance with state regulations. The Alliance was established to support market managers in their many roles, and to create a network of market managers, producers, vendors, and affiliates working together for the betterment of the industry. In 2011, the Ecology Center recognized the need for an inclusive and effective industry group for farmers’ market operators and managers to help raise the voice of the industry during policy discussions and regulation changes. The response from statewide partners was extremely positive and, with the generous support of the Columbia Foundation, the first meetings were convened in late 2012 and early 2013.
a voice in policy discussions, and an understanding of how state and federal policies impact our industry. support with statewide promotion of farmers’ markets, and increased consumer awareness of the value of buying direct. 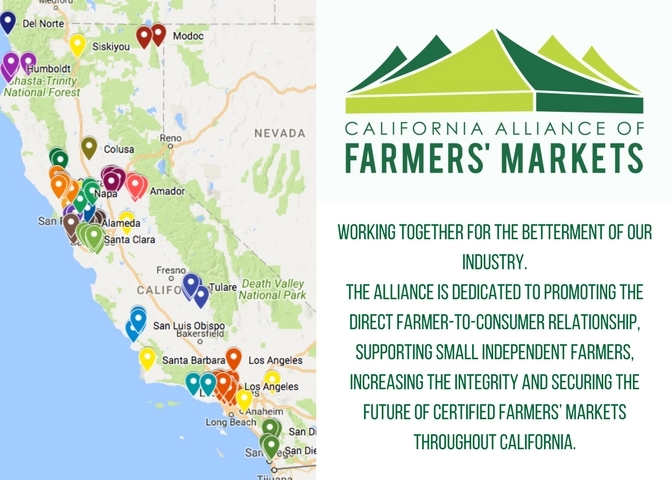 The Alliance offers members the opportunity to shape the future of the farmers’ market industry and strengthen their own market/market business. 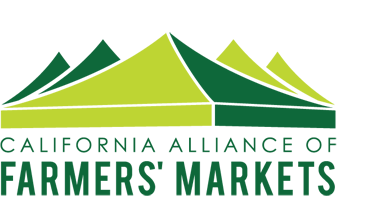 The California Alliance of Farmers’ Markets is hosted by the Ecology Center, which serves as a fiscal agent for the Alliance. The Alliance has a 13-member steering committee that helps chart the direction and activities of the organization. In the first term, Steering Committee members applied and were selected by the Selection Committee. For future terms, five Steering Committee members will be elected and the remaining 8 appointed. Elections will be based on geographic region. For information about our current Steering Committee members, visit our Steering Committee page. Advocated lower vendor fees, which resulted in $2 instead of $6 per market day.